Over the years Rovex Tri-ang produced four types of locomotives, six types of wagons and two types of coaches. 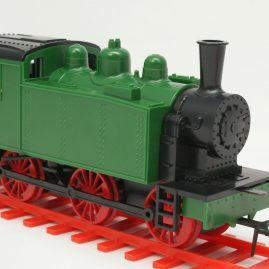 Locomotives and wagons came in a variety of colours, some more common than others. The locomotives run on batteries. 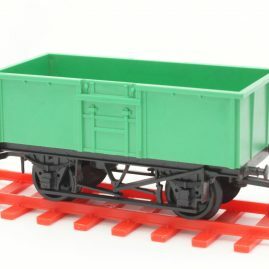 All rolling stock has plastic wheels. The locomotives have two switch levers, one on each side. The right switch is the reverse switch and therefore marked as “R” on some of the locomotives i.e. the Ruston shunter. The left switch is the power switch marked as “S” on some of the locomotives. The power switch has a center position as neutral in which the power is shut off. In either the right or left position the power is turned on. With clever use of the track side switches a locomotive can either be stopped or reversed depending on the position of the track switch and the side of the track on which it is clipped. The track side switch itself has a trigger switch with three positions. The center position is the neutral position marked as “FREE”. This allowes the locomotives to pass without any interferance. The two other positions of this trigger switch are marked “LEFT LOCK” and “RIGHT LOCK”. In these positions the arm on top of the track side switch is rigid in one direction and flexible in the other thus allowing to switch the locomotives depending on their direction. The pictures below link to the rolling stock photo galeries. It shows all types and some colour variations. All items are from my collection.